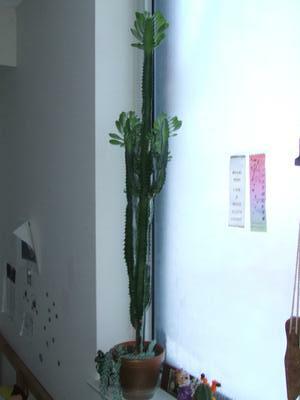 I have a tall African Milk Tree (Euphorbia Trigona). I have had it for almost 3 years now, and it is in its original pot (see photo). However, it grew 11.5 inches since I first got it. It is now 39''. The pot height is 5.5'' and 6'' across (at the top). The cactus is doing well. Should I leave it as is, or repot? Oh, and if repot, then what size of pot is best? Should I aim for wide and shallow, or more narrow and deep? Comments for What is the correct size pot? I would err on the side of not being too generous for this plant, simply because repotting it into too large of a pot can create a monster! Keeping it in a smaller pot stops it growing too big for its britches and outgrowing the space you have available. In their native habitat, these are a tree-sized plant, which may not be something to have in your house. So having said that, I recommend only going up one size - so a pot that is about an inch bigger all around. This would mean a pot about 6-8" tall and across, depending on what the pot is made of - the heavier the pot the less need for size. I prefer taller rather than wider for tall plants as there is less risk of them toppling over. You can also start cutting it down to increase the bushiness, so it doesn't just keep getting taller. And where would you recommend cutting it? Just across, at the top? OR try and propagate the smaller side shoots? Do you want it to get bushier and more compact? Then cut off the top. More on pruning here; Pruning Succulent Plants.